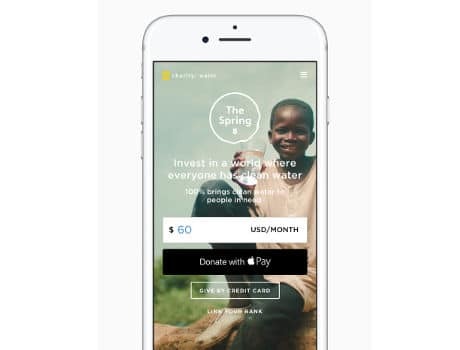 Apple Pay users can now make charitable donations to nonprofit organisations by clicking on a Donate with Apple Pay button found at the checkout of supporting mobile apps and websites. “Apple Pay support for charitable donations kicks off today with nonprofits ranging from global organisations such as Unicef to startups like Charity:Water, and more nonprofits will offer Apple Pay over the coming months so their supporters can make easy, secure and private payments,” Apple says. “Websites and apps tell us they see twice as many people actually completing a purchase with Apple Pay than with other payment methods,” says Jennifer Bailey from Apple Pay. Organisations that will add support for Apple Pay “soon” include American Cancer Society, CARE, DonorsChoose.org, PBS and its local stations, and United Way.